10 years Still Strong - John Owen's Adventure, Inc. Here we are in February, 2018. Ten years from diagnosis. It is so hard to believe just how fast these 10 years have flown by. What is even more incredible is the constant outpouring of support from our family, friends and this awesome community. We have put over $500,000 directly into the hands of science to advance the treatment of Duchenne and one day, God Willing, a complete cure. Thank you to each of you for the love we continue to feel from you. We are gearing up for our 2018 events. Please mark your calendar and plan to attend! Sunday March 18, 2018 ~ JOA Nerf Battle~ We love this event because your kids can run around from 130 pm to 4 pm and you will have a very peaceful Sunday Night! Seriously, this is one great family centered event, fun for all ages. $10 per player. We supply the bullets, you bring the nerf guns and safety glasses! Oh and bring cardboard too so the kids can build cover! Please share this flier (click) and pre-register on line or at the door! Impact Team Sports and the Impact Lumberjacks travel baseball organization are coming together to help derail Duchenne for good by spreading awareness of Owen's disease and raising money to help in the research effort to find a cure. The new awareness program is called "On Base for Duchenne" and was created in partnership with JOA. Chris Hammer-Huber, Impact Team Sports V.P., is asking baseball players and parents to seek sponsors at all monetary levels to join in and help the cause. After each of the team's games, the player who reached base the most times (via hit or walk) will be named the “On Base for Duchenne” Player of the Game. At the end of the season, the total number of bases will be added for the players and our sponsors will write a check for all the bases earned. In essence, the players will raise awareness of Duchenne and money to find a cure with their play on the field during the season! 5.5.18 we will rock the streets of North Royalton in our CAMO Run! Please consider joining us on Saturday morning. Race kicks off at 730 am. You can run the 10k, 5k or walk the 5k! All levels welcome! 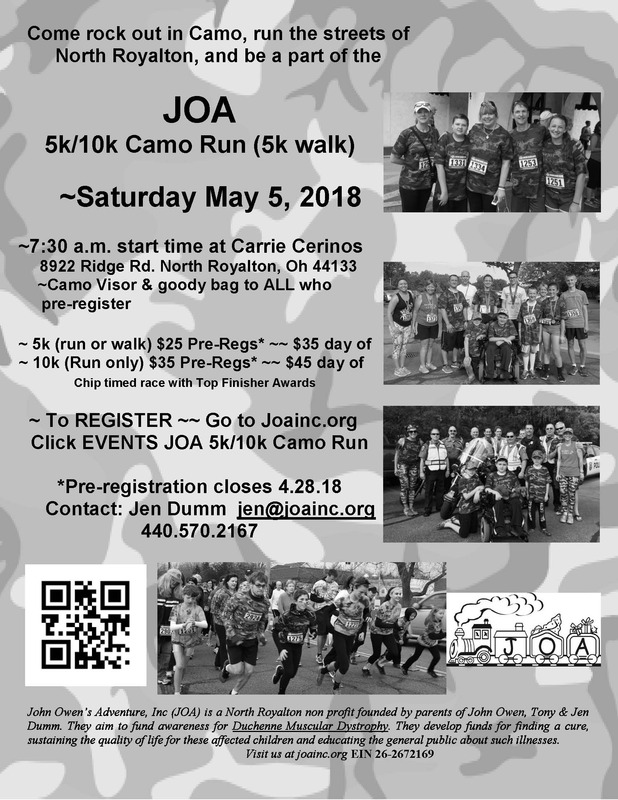 Pre-register by 4.28.18 to be sure to grab a goodie bag and great JOA gift! This event is so successful because of you! Your willingness to share our needs and donate products / wine (for the wine pull) and Silent Auction is awesome! Keep it going in 2018. Please share this request (Click) and the pledge request (click) with your workmates and at your favorite stores! ​~NEW THIS YEAR Nikos Gyros! We need your help in securing PRODUCT DONATIONS! Please print the Donation Request Letter and the Pledge Card and share with your workmates, neighbors, friends anyone that is willing to help. ​We also would LOVE for your to help us with the Wine Pull~ Please donate your favorite bottle of wine (approx. value $20). ​We are so blessed by your support! Thank you and we hope to see you the Second Saturday in July! ​So what is going on? We are all doing great, it’s like the same ole same ole, which is really, really good! The boys are hitting the books very well, earning great grades. Wade is in ski club this year and loving it! Rutger is taking a few college courses while in his sophomore year at NRHS. And it is impossible to believe that Owen will be graduating from St Albert the Great this June, moving on to North Royalton High School. So proud of him as he was commanding his future at the NRHS counseling meeting. That maturity switch just kicked on in. We could not be more proud! We continue to follow CRISPR/Cas9 with great faith that we will see an end to this horrific beast. Please continue to support JOA through prayer and pocket, as because of you we will #derailduchenne! I can tell you, we have raised as much as we can. Not just money, not just awareness but community and strength and memories and adventure and joy and friends…. We’ve done an awesome job in embracing this journey to fight this beast as best as we can. Driving back home, I couldn’t help but watch Owen as he looked past the window. The memories of these drives home after each milestone visit with Dr. Friedman….. new casts, new meds, new stretches, new equipment, new surgeries, new fears……. But you know, we made it through. No wait, not we, He made it through just like the warrior he is. Of course there were days, times, nights, weeks when we let fear win. When we let Duchenne push it’s way to trump our joy. But more and more, we have learned to not let fear win, to beat it down and tell Duchenne to Stick It. We don’t know what the next 10 years are going to look like, but if they are as joyful, beautiful and amazing as these last 10 have been, then Bring it. How blessed we are to have Dr. Friedman leading our journey, as equally blessed to have every soul that continues to lift us up and stand by our side on this journey.